Are you missing 50% of your shoulder training? Shoulder presses target the front or anterior deltoids leaving your side deltoids and read or back deltoids under-trained. Its time you use lateral raises and bent over lateral raises exercises to build side and rear deltoids muscles to target your lateral rear deltoid heads and get the perfect round, muscular shoulders every bodybuilder dreams of. Most bodybuilders have perfect deltoids - anterior heads that is. The high volume bench and shoulder presses stresses the anterior deltoid muscles exclusively. But this comes at an expense. Your lateral deltoids, that give your shoulders the wide look and your rear deltoids, that give your shoulder the balanced, round shoulder look, are chronically under-stressed. This can, at best cause less muscular development of shoulders and at worse cause posture problems that spoil your upper body look. Add lateral raises and bent over lateral raises exercises. 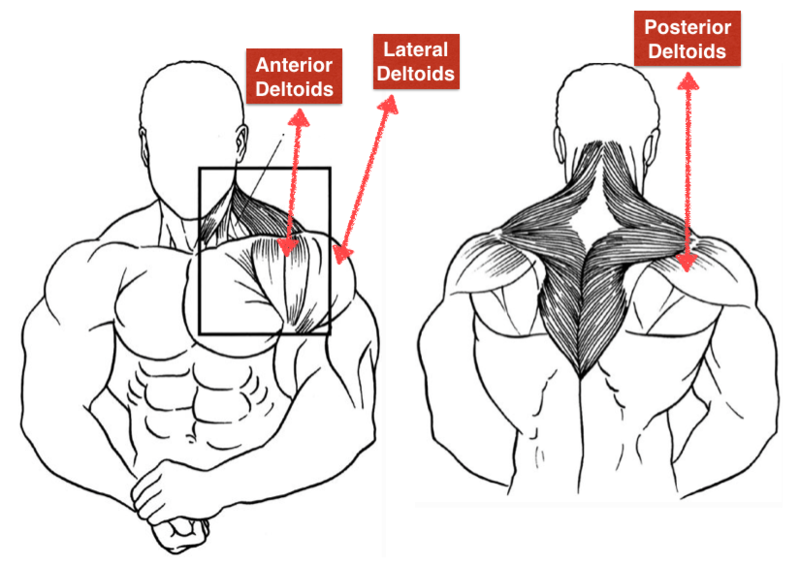 They build your lateral and rear deltoid heads for complete shoulder muscle development. But before you jump in, remember this. The right technique is of utmost importance in these exercises, without which you will get only 10% of results. You can perform lateral raises, also called side laterals or side raises using dumbbells and cable. Cable has its own advantages, but here I am showing the dumbbell versions. Seated is optimal as it prevents using momentum and helps target deltoids. Loading: Use low weights and execute with perfect form. Its not an ego lift. 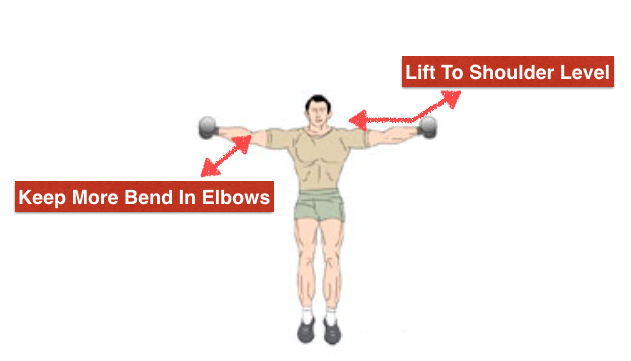 Step One: Grab a set of dumbbells and let them hang on the sides as shown. Bend your body forwards and bend your knees too. This is the optimal posture to laser target your deltoids. Step Two: Take a deep breathe in and lift the bells to the sides while maintaining a slight bent in your elbows. Initiate with your deltoids, not arms. The arms should be in line with your shoulders or slightly behind to target the rear delts too. Want safe shoulders? Its best not to go above your shoulder level or else you risk shoulder impingement. Step Three: Lower the dumbbells back to start position. One tip from Arnold: The legend says that when you lift, turn your wrists "pouring water out of a pitcher". The Bent over lateral raises exercise target the posterior or rear deltoids muscle and requires excellent shoulder and chest flexibility to perform it as it requires your elbows to get back in line with your shoulders. Position: Seated on the edge of a bench or standing while bending the torso as shown. Loading: Use only 5% of your your shoulder press weight as this exercise is difficult to perform with correct form. 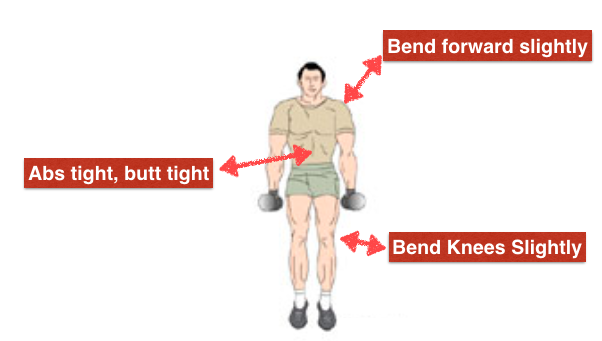 Step One: Grab a set of dumbbells and get into the position shown below. Bend such that your upper torso is parallel to the floor. A less than 90 degree bend has been shown to be less effective stimulation for posterior deltoids. Step Two: Inhale deeply and raise the dumbbells up to shoulder level. Do not bounce as it defeats the purpose. Also keep the dumbbell stable as shown. If you twist your wrist and your thumb is at higher level than your little finger, there is chance of shoulder impingement. Finally, let the arms move in line with the body, not too forward, not backward either. I have included 10 best shoulder exercises for a complete shoulder muscle development. Use them for variety and gains. 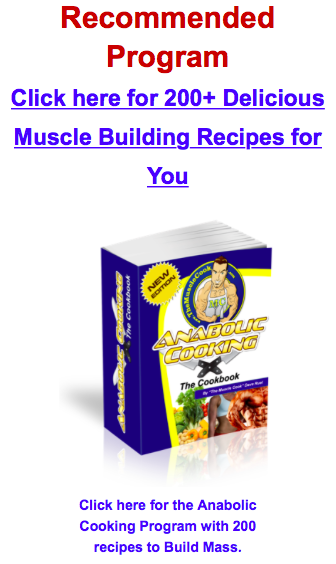 I highly recommend the NNMB Muscle program for natural muscle gains.